The island of Menorca is just 21 miles from Majorca but is very different in style and character. Menorca is quieter, more relaxed and low-key, less commercialised, and comes in two halves. The northern coast of Menorca tends to be rocky and rugged, with tranquil, undeveloped fishing villages and great snorkelling and diving opportunities. The south coast has the big sandy bays that the island is famous for, and this is where you will find the better known, busier holiday resorts. There are said to be over 120 beaches on the shores of Menorca, and everyone has their favourites. The locals are exceptionally friendly and welcoming and the whole island is family-oriented in the way the Spanish usually are. 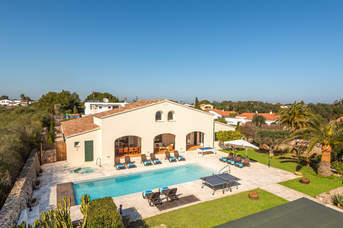 You may struggle to choose just one villa from the many we have in Menorca, but we are confident that whichever home from home you go for, you will have a brilliant time! If you want a totally relaxing break from your everyday life, Menorca is the place to go. With outstandingly beautiful scenery, glorious beaches and guaranteed sunshine, along with interesting towns and cities, high quality food and wine, and plenty to keep children occupied, this little island really has got the lot. It’s got stunning wetlands teeming with wildlife as well as the greatest concentration of prehistoric sites in Europe! Even a small holiday resort like Es Canutells is full of surprises! 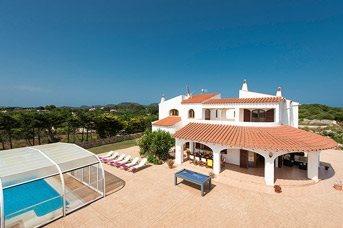 We have been helping people choose their perfect villa in Menorca for nearly 30 years and would be delighted to discuss the kind of holiday you need. There is so much on offer that a week or even two is nowhere near long enough, which is why our customers keep coming back for more. Some of our customers are happy to spend most of their time at the villa, others want to explore the whole island. Wherever you are based, the island is small enough to get around easily so you can see it all if you have the stamina! We have villas that are perfect for large families and groups, and others that are great for couples. We have villas deep in the countryside, and many in the heart of the resort with shops, bars and beach just a stroll away. We also have our Very Villa Plus selection, our personal favourites that we believe offer something a bit extra. But all our villas are special, and we are confident that you will be really happy whatever you choose. Each resort within Menorca offers something different, from traditional and authentic to stylish and contemporary – you’ll be certain to find something to suit everyone’s tastes! They all have a number of good shops and places to eat and drink nearby, plus almost every resort has a splendid sandy beach to enjoy too. Addaia is a low-key resort, set around a picturesque marina which is a popular spot for mooring yachts. There is not a beach but the resort is home to some stunning countryside walks along the rugged coastline. There is a small selection of restaurants. Arenal den Castell is a low-key, purpose-built holiday resort in a magnificent setting on the rugged northern coast of Menorca. It has been created around a lovely horseshoe-shaped bay, beneath rugged cliffs. The gorgeous sandy crescent of beach is a magnet for families and young couples, and keeps them coming back for more. On the southeast coast of Menorca, capital, about 20 minutes’ drive away from the capital Mahan, Binibeca is three places that have merged into one. This conurbation stretches from Cala Torret through Binibeca Nou – with a lovely little sandy beach – and on to the famous whitewashed village of Binibeca Vell. Between them they cover some great shops, bars and restaurants. Once a fishing village, Cala Blanca was built in the nineties around a pretty crescent bay, with turquoise water and soft white sand framed by pine forests. The focal point of this quiet, modern, family-oriented holiday resort is the beach – a sandy cove surrounded by pine trees. The calm, shallow, crystal clear water and white sands are protected by low, rugged cliffs. Cala Galdana on the south coast of the island is built around an exquisite, symmetrical, horseshoe-shaped bay, surrounded by almost vertical limestone cliffs covered in pines. The beach is wonderfully sheltered with soft white sands lapped by warm, shallow, turquoise water that is perfect for swimming, scuba diving and snorkeling. When you have had enough sun, you can enjoy a picnic under the shady pines that separate the beach from the road. To the West of Cuitadella, along the coastline, is a succession of small beaches and pretty coves. The bustling resort is centred in Calan Forcat with bars, cafes and restaurants abound. Calan Bosch is a big, busy, relatively new holiday resort on Menorca’s southwest coast. The attractive, upmarket marina is the focal point, surrounded by shops, bars and restaurants that get quite lively after dark. It is a relaxed, easy-going place that suits families, teenagers and couples alike, and is particularly popular with the British holiday goers. Calan Forcat has three small sandy inlets with platforms for sunbathing, or diving, swimming and snorkelling in the bright translucent waters, but not much of a beach. However, nearby Calan Blanes has a lovely sandy beach lined with palm trees. Calan Porter is one of the oldest, best established holiday resorts on the island, occupying an enviable spot perched high up on limestone cliffs looking down on to a beautiful beach. The amazing cliff-top setting means fabulous views all over the bay, so keep your camera fully charged! On the West coast of Menorca, Ciutadella was once Menorca’s capital. When the capital was moved to Mahon, both nobility and church stayed behind and Ciutadella escaped the ideas and architecture that colonial rulers brought with them. The result is a pure Catalan city, stylish and artistic. Es Canutells was once a small fishing village set in a breath-taking gorge on the south east coast. It is one of the islands’ least developed holiday resorts without the bustle and tourist razzmatazz of the bigger, newer developments. 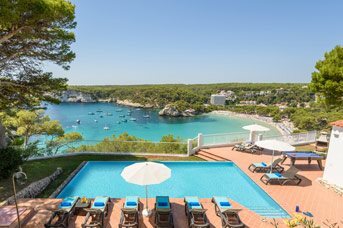 Es Castell is a picturesque resort situated on Menorca's South East coast. A small prestigious and laid-back resort, where you can indulge in the views of the Cales Fonts harbour while chilling out in a trendy bistro or charming waterside bar. Stroll around this pretty town with its picture postcard views and savour the charm and culture bursting around you. If you want silky soft stretches of sand, dramatic scenery and fantastic watersports than look no further than Menorca. The fine sands and crystal-clear waters are a must see The island’s atmospheric capital, Mahon is 10 minutes’ drive away. Mahon, the capital of Menorca, is a lively city rich in history and culture, built along the largest natural harbour in the Mediterranean. Mahon is well known for its classy nightlife and restaurants, particularly in the waterfront bars and clubs of the harbour quayside, the Moll de Llevant. The small, relaxed and quaint resort of Playas de Fornells – not to be confused with Fornells – has a picturesque sandy beach, several shops and places to eat and drink, as well as a small splash park. The town is also close to the island’s only golf course as well as a selection of water sports facilities. Punta Prima, on the south east coast of Menorca, was one of the first holiday towns to be developed on the island which may be why it looks and feels rather more Spanish than the newer holiday resorts. Punta Prima has a special atmosphere and charm, and a very laid-back attitude. It’s a great place for paddling and snorkelling and there are plenty of beachfront bars and restaurants to help you recover from your exertions! The quaint coastal resort of S’Algar is positioned on the far east side of the island, close to Mahon. Although the resort has no beach, it does have a rocky bathing platform where you can swim and sunbathe. The town also has several shops and traditional restaurants to enjoy, and sandy beaches can be found within a short drive. 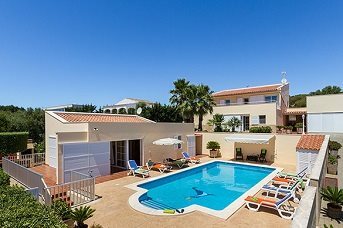 Sa Caleta is conveniently located on the West coast of Menorca between the resorts of Son Blanc and Santandria and the ancient capital of Ciutadella is 1½ miles away. Santo Tomas is a small, peaceful, man-made holiday resort in a fantastic location on the south coast between Son Bou and Cala Galdana and has just one main street. You go there for the two glorious beaches, which are what this place is all about. The perfectly maintained sands are surrounded by gentle hills and woodland. Son Bou is a fairly new purpose-built holiday resort catering for an international crowd. It is in a spectacular location on Menorca’s rugged south coast. You approach the town by road through a formidable tunnel carved through the hillside. The resort tumbles down the tiered wooded hillside, past luscious planted gardens with wonderful views of the coastline. The clean well-kept Son Parc beach is very natural and unspoilt, which is all the more remarkable as it is one of the best beaches on the island in a stunning setting of atmospheric sand dunes and the dramatic, rugged coastline. However you can still hire sunloungers and parasols, pedaloes and canoes as well as find refreshments at two beach bars. Menorca offers a wide variety of places to visit should you wish to venture away from your pool. Nothing is very far away. Beaches play a large part in these choices and you will always be able to find a small un-crowded beach if you look hard enough. The old cities of Mahon and Cuitadella not only offer a little bit of history, but are also good for shopping and have an abundance of harbour side restaurants. Around the island there are a few sites of historical importance and are well worth a visit to get a feel of how easy the past life has been in Menorca. Binibeca Vell is the work of architect Antonio Sintes, and it was built in 1972. A bit like a film set, it has a church steeple but no church – it is purely decorative! Love it or loathe it, this place somehow works, and is hugely popular. With its tiny, picturesque, whitewashed houses and twisting flights of steps leading up from cobbled streets, you will believe you are in an ancient fishing village, complete with small scenic cove and harbour. It has a handful of restaurants, one of which has a swimming pool for customers to use. It is well supplied with shops selling gifts, leather goods and clothes, and has a supermarket for stocking your villa with the essentials. The Caves of Xoroi in Calan Porter are just not to be missed and boast a fantastic panoramic view out to sea! By day, the caves are a popular tourist attraction with a cafe and gift shop. By night the caves transform into a lively disco and bar offering the occasional live music, where you can enjoy an evening cocktail or more as you watch the sun set over the sea. If you love fresh seafood, you have come to the right place, you might never even use the kitchen in your villa! The beach front restaurants at most of the holiday resorts offer seafood paella, or appetisers like calamari and red Menorcan prawns, followed by red mullet, mussels, swordfish, monkfish or sea bass washed down with a bottle of local wine or Sangria. The fishing harbour of Fornells gives you a great choice of top-notch harbour side fish and seafood restaurants. 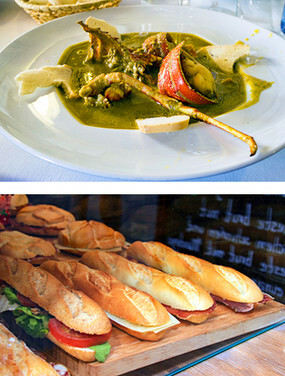 For dedicated carnivores, most menus offer a variety of charcoal-grilled meats, suckling pig and imaginative tapas. If traditional Menorcan dining appeals to you, you will find the real deal in Ciutadella, with plenty of Spanish restaurants with an exuberant local clientele, and authentic tapas bars for grazing. Some of the bars can get quite lively in the evening, with live music till late. International food such as Chinese and Italian is widely available alongside five course gourmet dining, but there are plenty of places for burgers and pizza if you are suffering withdrawal symptoms! The island is very family oriented so mini-portions for small people are not a problem. Mahon with its busy port, twice weekly market and bustling shopping streets is the island’s capital. Until 1721 Ciutadella was the capital, but when the British were in charge they moved it to Mahon to take advantage of one of the largest natural harbours in the world. Mahon, known locally as Mao, is a lively city rich in history and culture, with a splendid Gothic cathedral. The maze of narrow streets in the historic centre of Mahon are lined with stylish boutiques and designer stores as well as interesting independent shops selling leather and pottery. If you love markets, don’t miss the Mercat Claustre del Carme, just off Plaça d'Espanya. When you are all shopped out, cakes and ice cream at one of the many pavement cafes are highly recommended. If you have time, visit the 18th-century gin distillery and well-preserved fort. Mahon is well known for its high quality restaurants, particularly around the harbour. Nowhere in Europe has a greater concentration of prehistoric sites than Menorca. The Naveta de Tudons near Cala Blanca is a spectacular and well preserved megalithic chamber tomb that is over 3,000 years old. This Bronze Age burial chamber looks just like an upside down boat, made of huge stone blocks 4 metres high. Human remains along with bronze jewellery and other ornaments, weapons and ceramic bowls were found inside. With over 120 beaches in total, it is said that Menorca has more beaches than Mallorca and Ibiza together! In addition to the lovely stretches of sand in the urbanised areas, there are a wealth of beautiful sandy beaches all along the coastline. Many of the beaches are still in their virgin state but most can be accessed fairly easily and all are accessible by car, albeit by rough country lanes at times and parking is often a little way from the beach. The island of Menorca is very small, taking only an hour or so to get from one end to the other, therefore you can choose any of the below beaches to visit as all will have an easy journey time from your villa. Whatever your choice, there will be a restaurant or beach bar close by, often with a choice of shops also in close proximity and many of the larger beaches have a choice of watersports. On the North coast, Arenal De Son Saura is one of the most attractive beaches on the island but can only be reached by crossing over farmland with much opening and closing of gates. The farmer charges a toll for the adventure but the journey is definitely worth the effort. Pine-covered cliffs look down onto clear blue water and a beach of soft white sand backs onto extensive pine woods. Located on the South-East coast, approximately 20 minutes drive from Mahon and a short walk from Binibeca centre, this resort has a small but picturesque golden, sandy beach, with rocky coastline on each side. The beach is accessed by a wooden boardwalk and has a large, shady area towards the rear - ideal for picnics! This beach is sheltered when the North wind - or Tramontana - is blowing and there are often yachts at anchor a little way out to sea. The wooden beach bar, perched on the rocks at the southern edge of the sands, claims to be the only place in Menorca where you can drink with your feet in the sea. The beach has lifeguards from May to October with good facilities including ample parking, public toilets and sun beds, shades and pedaloes for hire as well as a diving school in the cove at Cala Torret. There is also a beachwear shop within a 5 minute walk. Binisafuller - or Binisafua as it is sometimes known - is a small but beautiful beach on the South coast of Menorca, close to the authentic resort of Binibeca. Binisafuller village has a small but good bar/restaurant and the beach has white sand and shallow, clear water - ideal for families! Cala Alcaufar is less than one mile from the resort of S'Algar on the south coast of the island of Menorca. The resort is a picturesque, small sheltered inlet with a sandy beach that shelves gently into the sea. The beach is overlooked by the fishermen's cottages that reach down to the waters' edge and the resort is popular with families and children. The resort also has scenic walks out to an old Martello type tower on a headland, where there are good views out to S'Algar and the Isle de L'Aire at Punta Prima. The popular resort of Cala Blanca has a wonderful beach with white sand, easily accessible on foot from the resort centre, or by car or bus. The beach has shallow water and a waterchute - perfect for children! There are good facilities including lifeguards in high season, pedaloes, parasols and sun lougers available for hire, public toilets and showers, a kiosk, bar and restaurant. You can also use the facilities of the 3 local hotels. On the North coast, this beautiful wild place with its sandy beach and jagged coastline can only be reached by a walk of around 30 minutes. Pick your way along the path lined with trees and fragrant bushes, wild honeysuckle and masses of wild flowers. The last stretch of the walk is down a steep sandy slope. 'The Queen of the Coves,' Cala Galdana has a wide arc of golden sand bordered by wooded cliffs. Cala Galdana is one of the most ecologically important coves on the island, as well as being one of the most beautiful. The deep, horseshoe bay with sloping sand and shallow water is great for families. You can also hire sunlougers and parasols, windsurfing and snorkelling equipment, pedaloes and motorboats,learn to sail and scuba dive or take a boat ride along the coast to picnic in a peaceful cove. There is ample parking at the entrance to the resort, a few minutes walk from the beach, which is easily accessible by steps or a ramp. Facilities include a kiosk, cafe, bar and a restaurant with toilet facilities, as well as a tennis court, mini golf and shallow water slides for children. Many people consider this one of the most perfect spots on the Menorcan south coast. You'll find you won't be alone here as others make the bumpy trip across farmland down the track leading to the gorge. There is a small beach bar and one can hire parasols or enjoy the welcome shade of the pine trees. The beach shelves gently into the sea giving ideal conditions for swimming. Best reached on foot from Cala Galdana. The walk takes around 30 minutes, passing the rocky cove of Mitjaneta before arriving at a deep sandy beach surrounded by cliffs riddled with caves. Cala Picas bay is located on the very western tip of the island, on the outskirts of Calan Forcat and Calan Blanes. This beautiful cove beach is popular with families having calm and shallow crystal clear water. The small narrow cove is easily accessible on foot with a descending track and steps down to the sand. Free parking is available on the streets above with a choice of shops and places to eat in the surrounding area. Located on the North coast this beach can only be reached by climbing the whitewashed steps leading over the wall just to the west of Binimel-la. Well worth the effort, you'll discover a spectacular sandy beach framed by a lush pine and tamarisk wood and sea stacks rising out of the perfectly blue water. Sandwiched between Sa Caleta and Cala Blanca, on the far West coast of the island, is the pleasant beach of Cala Santandria. With its beautiful white sand and shallow, clear water, its no surprise that the beach is popular with families. There is a cafe and restaurant overlooking the sea with the resort centre within easy walking distance. There is also one very popular restaurant inside a cave! The beach also has parasols and sunbeds for hire and is easily accessed by either public transport or by car, with free parking by the beachfront. On the way to Fornells turn left at Ses Salines. The beach is accessed by a wooden walkway or by road on the western side of the bay, but it is quite a long detour. The beach is sandy and backed by dunes and although well used rarely gets overly crowded. In the summer months there is a lifeguard service and there are eating places and supermarkets in nearby Playas de Fornells. The beach is popular for swimming and windsurfing and kitesurfing are also popular on windier days. The beach is located below the resort centre, flanked on either side by spectacular limestone cliffs. It's a beautifully sheltered, deep expanse of white sand which can be accessed either by lots of steps, a steep slope or by road. Sunloungers, parasols and pedaloes are available to hire and there is ample car parking space available in the shaded area adjacent to the beach. There is also a beachwear shop a few minutes walk from the beach and toilets can be found at any of the rustic beach bars. Tennis courts and mini golf are also available nearby. To the West of Cuitadella, the coastline enjoys a succession of small beaches and pretty coves including small stretches of sand at nearby Calan Blanes. There are no beach bars available but there is a small kiosk and the hotel overlooking the bay has its own restaurant and exterior pool terrace where you can sit and enjoy a drink and take in the view. A variety of shops, bars and restaurants can also be found within a few minutes walk. The beach is easily accessible by car or bus, with steps and a ramp down onto the beach itself. There are public toilets and pedaloes, parasols and sunloungers available for hire. With chic restaurants and shops lining the busy yachting marina, Calan Bosch is one of Menorca's most fashionable areas. The resort has 2 sandy beaches, one being a small bay by the marina with sunbeds available to hire. The second is known as Son Xoriguer which is a longer stretch of sand with watersports during the summer months and several bars and restaurants nearby. This beach is easily accessed by car or bus, or a few minutes walk from the resort centre, with steps and a ramp onto the sand. Lifeguards man the beach in high season only and pedaloes are also available for hire. There is a kiosk, cafe and bar on the beach with a greater choice of restaurants and eateries within a few minutes walk. The impressive Calan Forcat bay has a small sandy cove with crystal clear waters, flanked either side by rocks and is overlooked by the Hotel Globales Almirante Farragut which has a huge exterior swimming pool and bar area where you can sit and enjoy a drink or bite to eat as you embrace the stunning panoramic views over the cliffhead to the open sea. The bay itself splits into 2 sandy coves sandwiching a small rocky inlet in the middle with a bridge where you can stand and look over into the crystal clear waters in the rock pools below. Occassionally the waters attract purple jellyfish for a couple of days at a time which makes swimming impossible but are an incredible sight! A long sandy beach on the north coast which shelves down from the sand dunes to the sea. The surrounding countryside is open in character with low rolling and treeless hills. A beach with a quiet, peaceful atmosphere. Located between the larger resorts of Binibeca and Calan Porter is the deep inlet of Canutells with its small, sandy beach and few boat moorings. The beach is "virgin" in that it is left in its natural state and is not cluttered with sunbeds etc. There is ample parking. For toilet facilities visit the rustic bar overlooking the beach and order a refreshing ice cream or drink. Los Delfines beach is a small stretch of sand in a deep, rocky inlet of turquiose blue water. There are bathing platforms along the rocks and it's an ideal place for the snorkelling enthusiasts. The picturesque resort of Punta Prima has a good expanse of soft, white sand with ample room for beach games. A second, narrower stretch of sand with rock pools is adjacent. The beach is overlooked by 'Isla Del Aire' - an uninhabited island with a lighthouse where passing yachts often take shelter. The beach has good facilities making it very popular with families. The bars on either side of the beach are ideal for a spot of lunch, a main meal or a cool drink. The beach is easily accessible either by car, with ample parking by the sand, or a short walk from the resort centre. There are toilets available in the beach bars, as well as tennis courts, hand ball and mini golf facilities nearby, sunloungers, parasols and pedaloes for hire and a diving school in the local hotel. Lifeguards man the beach from June to September and swimmers should heed the flag-warning system and only swim if the GREEN flag is flying as there can be currents in the sea. Sa Caleta, just to the South of Ciutadella, has a small but picturesque sandy beach with an old watch-tower, which used to stand guard against would be invaders. The white sandy beach and clear waters are ideal for families and swimmers, and you'll also find sun lounges, parasols and pedalos for hire. Sa Mesquida, a small village on the east coast of Menorca close to Mahon, boasts one of the many fantastic beaches the island has to offer and is well worth a visit. The beach itself is 320 meters of golden sand surrounded by calm waters and rich countryside and is very popular with divers. In 1781, Hispanic French troops arrived in Sa Mesquida to conquer Menorca but the attack was unsuccessful and the island remained in British hands. A defence tower was built on the cliff overlooking the beach which still stands today. Parking is available a little way from the beach, and the nearby village has a small shop and a restaurant, considered to be one of the islands' finest seafood restaurants serving freshly caught fish, boasting wonderful views over the water as you dine. S'Algar is an attractive and well established holiday resort and whilst there is no beach as such, there are many rocky platforms on the headland where people can sunbathe. The waters are clear and enticing and perfect for diving enthusiasts. There is a fully-equipped diving centre where all equipment can be hired and tuition is given. Tennis courts, bowling green and diving are all available in the resort. A long, narrow beach of pale golden sand, Santo Tomas is virtually a continuation of the beach at Son Bou. A path at the western end leads to the quieter beaches of San Adeodato and Binigaus. A flag warning system is also in use here due to the occasional currents and one should only swim when the GREEN flag is displayed. It is a great favourite for families as the beach, shops, bars and restaurants are all within easy reach. These 3 neighbouring resorts all overlook the beach of Son Bou, the longest beach on Menorca. It has almost 2 miles of pale, golden sand shelving gently into the turquoise waters with beach bars serving anything from a light snack to a 3 course meal. It's a holidaymakers paradise with facilities including windsurfing, water skiing, banana boats and agua-planing. The beach is easily accessible with a large parking area providing ample space to park your car and a boardwalk leading down to the sand. Public toilets can be found close to both beach bars, with a beachwear shop within a few minutes walk. At the Eastern end, twin hotels overlook the beach but the further along you venture, the more isolated you will become. It should be noted that at the western end of the beach, many sunbathers decide to abandon their clothing altogether! The water gets deep very quickly and due to occasional underwater currents there is a flag warning system which must be heeded with GREEN meaning it's safe to swim. However, for extra peace of mind, lifeguards man the beach from June to September. Set amongst pine-clad hills is the beautiful beach at Son Parc, wide enough never to get crowded. The sea is shallow and the dunes and pine trees at the back of the beach provide some much welcome respite from the sun! There is ample parking by the restaurant at the Western tip of the beach, with sunloungers, parasols, pedaloes and canoes all available to hire. The water is shallower on the Eastern side of the beach - perfect for families with young children! There is also tennis courts, the islands only golf course and a driving range nearby. Though smaller than some of its other Balearic counterparts, Menorca (or Minorca) is still one of the most idyllic islands to belong to Spain. Along with the relaxed lifestyle and stunning weather, the food is part of the reason why people keep coming back year after year. As Menorca is a Spanish island, you should expect plenty of tapas dishes, many of which you can read about in our Guide to Menorca, but the island does have some of its own foodie delights too. From roadside eateries to coastal restaurants, wherever you're based on the island, it's a certainty that you'll be close to somewhere that gives you the opportunity to sample some of the local cuisine. Don't forget, you can always rub shoulders with the locals at the markets to experience truly authentic Menorcan produce. 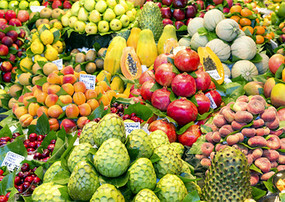 Many markets will sell other goods alongside some food offerings, but there are several markets on the island that are food-centric. One of these is the market in Ciutadella. The Plaza del Mercat and its surrounding winding sidestreets are full of fresh meat, fish, fruit and vegetables, much of which has been sourced on Menorca itself. Similarly, Mahon comes to life on market days, and different days of the week see different types of produce arrive. If you don't mind meandering through more craft markets that also sell produce, be sure to the visit the markets at Ferreries, Es Mercadal and Sant Lluis too. Although the majority of markets take place during the summer months, some do run throughout the year – but it's always worth checking when you arrive. Menorca is particularly good at making the most of its resources, and is the home of a number of food products that are sold worldwide. Though just a few are mentioned here, be sure to explore new tastes and flavours on your visit to Menorca – you never know what you'll discover! Caldereta de llagosta - Though one of the more expensive of the speciality dishes available in Menorca, this lobster stew is divine, and a definite treat that should only be experienced here, with the freshest of produce. Having originated with the island's fisherman taking it out to eat whilst they work, the dish has come a long way, and is now considered an expensive but popular luxury dish. Mahon cheese - As you might expect, this cheese is native to the town of Mahon, but is produced under strict guidelines across Menorca. The taste of the cheese varies a lot depending on how mature it is, so be sure to find somewhere to sample the cheese at different ages – you'll also find it included in many dishes across the island, and at certain speciality cheese shops back home too! Bocadillos - Sometimes, at lunch all you want is a snack, not a full-blown meal if you're likely to be eating out in the evening. Though at first glance a bocadillo may just look like a filled baguette, the Menorcans have taken to substituting butter for a thick, tomato juice which gives the bread an entirely new flavour. These are often made fresh to order, too, with fillings that can include meatballs and local sausages like chorizo and sobrasada. Few of us can truly replicate the authentic Menorcan way of cooking. Recipes have been passed down from generation to generation, perfecting the craft, but there are a few cheeky little treats that are easily made back on home ground. 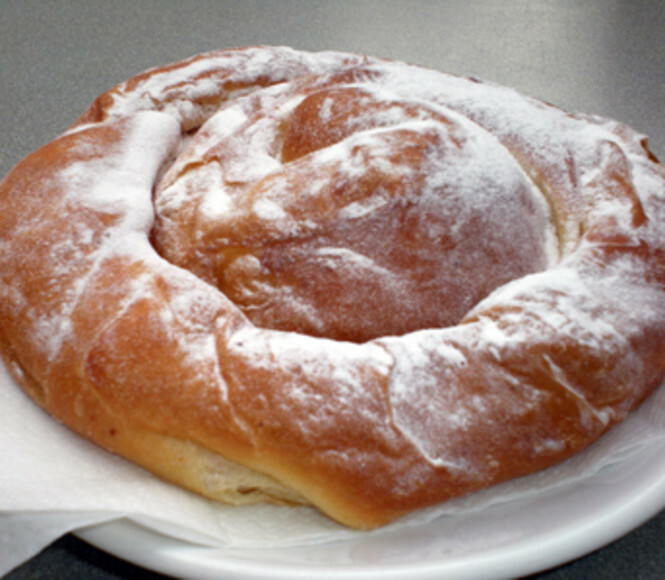 You'll seeEnsaimadas, a Menorcan sweet bread, everywhere on the island, and though it take a little time to prepare, that'll go quickly if you're sipping a homemadePomadaas you go! A bottle of locally made Gin Xoriguer – this can be sourced away from the island too in specialist stores. 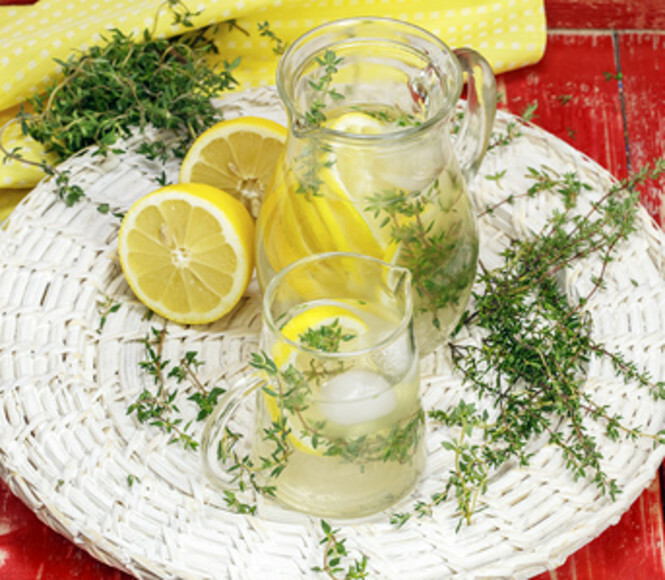 This simple recipe can be adjusted depending on how much gin you'd like to consume, but in terms of making the most out of the flavour, it's nicely paired with lemony drinks, such as decent quality cloudy lemonade – though regular lemonade is fine too. To mix, fill a tall glass with ice, before adding one-part gin to two parts lemonade. Finish with a slice of lemon! Easy, but delicious. Firstly, you need to dissolve the yeast in the warm milk and pop it to one side. Next, mix the salt and sugar together before mixing in the flour and the milk and yeast. Once combined, add the eggs and the olive oil before kneading until entirely blended and soft. Cover this with a damp cloth and allow to rise for one hour in a warm place – the dough needs to have doubled in size. After the dough has increased in size, you need to knead the dough again, and roll the dough out as thinly as possible over a floured surface and brush the softened butter on top. Next, we need to roll up the dough as you would a newspaper or poster. Select a side, and carefully roll it up, being careful to not tear the sheet of thin dough. Once in a roll, leave to rest for an hour. It should still continue to rise during its rest time. Once rested, coil the dough up loosely so that it almost looks like the swirl of a snail's shell. Now, for the last time, move the dough onto a baking sheet and allow to rise for several hours – it should be nice and puffed up before it goes into the oven.